San Francisco based art collective Rebar decided to take the concept of a parking spot to the next level. 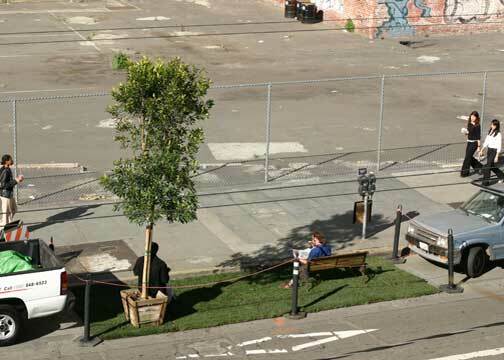 On November 16th they installed an actual park in a parking space in downtown San Francisco for their project PARK(ing), “a temporary urban park”. People enjoying the park had to feed the parking meter (ie. pay the rent) in order to keep the park open. PARK(ing) is an investigation into reprogramming a typical unit of private vehicular space by leasing a metered parking spot for public recreational activity. We identified a site in an area of downtown San Francisco that is underserved by public outdoor space and is in an ideal, sunny location between the hours of noon and 2 p.m. There we installed a small, temporary public park that provided nature, seating, and shade. Our goal was to transform a parking spot into a PARK(ing) space, thereby temporarily expanding the public realm and improving the quality of urban human habitat, at least until the meter ran out. Special thanks to Jason Laskodi for the tip on this awesome urban prank.